The many brethren and guests of Anderton Lodge 8470 were honoured by the presence of Assistant Provincial Grand Master Stewart Seddon at their regular lodge meeting. Picture left: The evenings menu card with some of photographs of Gordon Weston. Picture right: Stewart Seddon (left) congratulates Gordon Weston. This however was far from a normal meeting of the lodge as at this meeting the lodge was celebrating in honour of the 50th year in Freemasonry of Gordon Weston. The lodge was opened and the general business dealt with in the usual manner by the WM Malcolm Timms before Stewart entered the lodge and was offered the gavel, which on this occasion he accepted with pleasure and took the chair in order to preside over the celebrations and tributes which were to follow. Stewart then invited Gordon to take centre stage before going on to give a most sincere and heartfelt account of Gordon’s life and Masonic career. Stewart started by saying that he had spent a wonderful time at Gordon’s home talking with Gordon and his wife Joan, where he learned much about, as he put it, ‘Gordon the man’, and ‘Gordon the Freemason’, and which he was going to share with everyone here this evening. Gordon was born in St Helens in April 1935, a good year for many well known and respected personalities from the world of sport, politics, and entertainment were born in the same year including the ‘King’ himself Elvis Presley. There is also a Royal and Masonic connection as again born in the same year was non-other than the Grand Master HRH the Duke of Kent. In his early life Gordon lived with his mother Doris, father Laurence and older brother Tom, in St Helens where he went to primary and junior school before passing his 11 plus exams and attending grammar school where he was a keen rugby player and left with a ‘School Certificate in Art’. He also sang with the local church choir and won quite a number of singing competitions. On leaving school at 16 he began an apprenticeship at Pilkington’s Glassworks and gained an ONC and HNC at technical college during that time. Picture left: Malcolm Timms (left) presents Gordon with flowers at the end of the evening for his wife Joan. Picture right: Gordon and Joan relaxing at home. Also, when he was 16 years old, he met Joan Ashcroft at St John’s Church Youth Club at a Halloween party where they started courting, and in February 1958 they were married, meaning of course they celebrated their diamond wedding anniversary last year when they were so pleased to receive a letter of congratulations from the Queen. They went on to have two sons and later three grand children all of whom they are very proud of their achievements. Gordon, after finishing work at Pilkington’s started working with his brother in his electrical business before his working life took a dramatic and unexpected turn, he became a publican. Gordon and Joan had the Union Hotel in St Helens where they stayed for two years before moving to the Windle Hotel for a year and in 1974 they moved to Blackrod, to the Ridgway Arms (now called the Rivington) where they stayed for 12 years. This is a pub that is well known to most of the members of the Chorley Group, as it is central to the three Masonic Halls. They stayed in the licensing trade until 1988 when Gordon joined his brother-in-law in a printing business where he stayed until he retired in 1997. Gordon’s Masonic career is equally as long and distinguished. 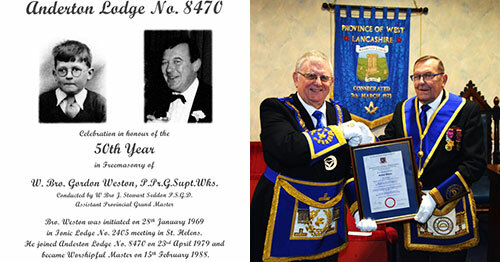 He was initiated into Ionic Lodge No 2405 in January 1969 and having served in all the offices he was installed as master on 18 January 1980 and continued to serve in various offices when there was a need. He joined Anderton Lodge in April 1979 becoming WM in 1988 and then went of to serve as treasurer for 10 years. His first Provincial appointment came in 1997 with the rank of Past Provincial Senior Grand Deacon and subsequently promoted to the very high rank of Past Provincial Grand Superintendent of Works in 2004. A gift from the lodge (note the 15-year-old malt whisky in the background). Gordon was exalted into Horwich Chapter No 2324 in September 1977, becoming first principal in March 1995 and again as treasurer of the chapter for 10 years. Gordon’s first Provincial appointment came in 2002 with the rank of Past Provincial Grand Sojourner and then in 2010 he was promoted to the very high rank of Past Provincial Grand Scribe Nehemiah in recognition of his work and commitment. Gordon is also a member of Horwich Rotary which he joined in 1977. Peter Lockett, Chairman of Chorley and District Group, then read the certificate, which is an acknowledgement of the Province of West Lancashire’s great appreciation of Gordon’s half a century of membership of the Craft. The certificate was then presented to Gordon by Stewart Seddon. After the Lodge was closed the brethren retired to the festive board which was a very relaxed and friendly affair in the wonderful surroundings of Brookfield Hall, with all present enjoying fine food, wine and fellowship. The toast to Gordon’s health was given by Arthur Ashcroft, who is Gordon’s brother-in-law (Joan’s brother), who said: “It is a great pleasure to propose this toast to Gordon, my brother-in-law in life, and my brother in Freemasonry”. Gordon suitably replied. 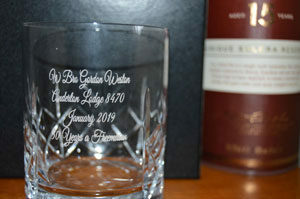 The last pleasant duty of the evening was the presentation to Gordon of a gift from the lodge as a memento of his 50 years in Freemasonry, this was an engraved glass and bottle of 15-year-old malt whisky. In closing the evenings proceedings, the WM presented Stewart with flowers for him to take home for his wife and then went on to present flowers to Gordon for him to take to Joan for allowing him to come out and play for the last 50 years. Gordon and Steward (sat) and to the rear, WM Malcolm Timms (centre) together with grand officers and acting Provincial grand officers.